It’s Fr Byrnes 5th Anniversary today! One of the many things Fr Byrne will be remembered for is the Confraternity of St Michael which began in 1991 with only a few members. The first meeting was held in the meeting room at the back of the Church at St Francis De Sales Oak Park in Melbourne. It then moved to the School library and then onto the Parish Hall. 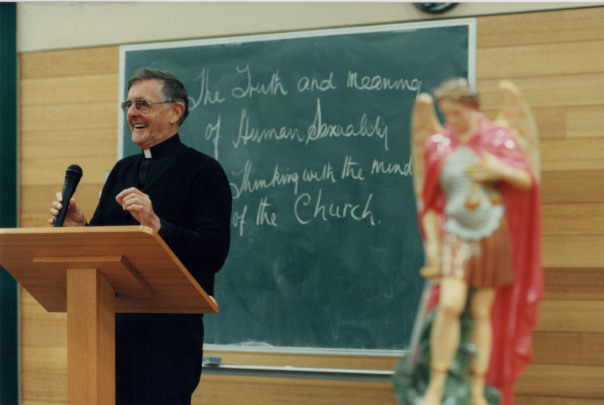 Little did Fr Byrne know just how much the Confraternity would grow over the coming years. People would come from all over Melbourne and Country Victoria for the weekly meetings at 7.30pm on a Wednesday night come rain hail or shine. Membership grew to well beyond expectations. The fruits of Fr Byrne’s labour over the years of the Confraternity produced vocations to the religious life, marriages and countless life long Catholic friendships.